Our work mainly involves dogs and, although we cannot provide directly for cats, we work closely with several local cat charities. We also endeavour to help small older ponies etc, through an association with ‘Happy Retirements’ and also help with Ferrets, Rabbits, Guinea Pigs and other companion small animals via advice and our neutering scheme. We always have a list of dogs waiting for new homes. The majority are in ‘foster homes’ (see our ‘fostering’ and ‘Dogs for Adoption’ pages) and some may be waiting in their existing homes until foster spaces become available. Through assessing the dogs and meeting prospective new owners, we try to ‘make a match’ that will last the dog’s lifetime. 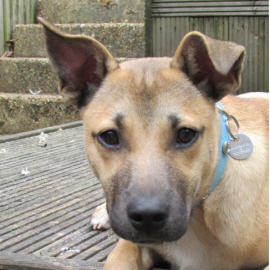 Please note – we are only able to home our dogs within the Sussex, South Surrey and West Kent areas. This is so that we can carry out a home check and follow up visit. It also ensures that we are able to provide post-adoption advice should it be needed. We also promote a neutering scheme to help prevent unwanted litters of most small pets and thereby minimise the number of puppies and other animals that need re-homing. For further information on our scheme for people receiving benefits, please contact Jan Meredith on 01403 864742. Sussex Pet Rescue is run mostly by volunteers. We are a network of helpers who do a variety of tasks from transporting dogs to vets, answering telephone enquiries, visiting prospective new owners and homes, following up dogs in their new homes, helping with fund raising and publicity, and caring for dogs whilst they are awaiting new homes. We cover all our volunteers’ expenses. We do NOT receive any grants from statutory bodies but rely totally on donations from the public and organisations that raise money on our behalf. If you could help with fund raising, please go to our ‘Be a Volunteer’ page for contact details. We are also pleased to receive any dog/cat food donations and our grateful thanks go to the various veterinary groups in Sussex who help us by offering discounted treatment. We run a stall at dog shows from time to time and are grateful for unwanted Dog Beds, Transport Cages/Crates, Leads, Collars and Dog Coats to sell, however storage is limited so please contact us first to see if we have an event coming up. …every time you shop online! All you need to do is click one of the images below, set up an account and go shopping to start the cash rolling in! 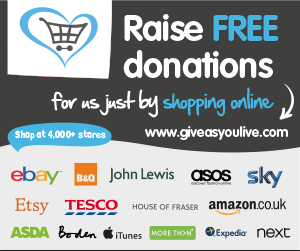 Why not set up accounts with both the above – that way chances are wherever you shop, you can donate.